I quite like the words "on a train" as opposed to "on this train". The way it's written doesn't even mean the train that was due to be used on that service. Wording is standard and can apply to a different train ... for example if something is pulled up on a running line for a safety check and train(s) behind can't get through / have to turn back short. Agreed it remains a cancellation as far as stations not served are concerned. Journey Checks regularly say "due to xxxx on this train" when it is not "this" train but a reaction of an incident on another train. 10:22 London Paddington to Hereford due 13:47 will no longer call at Slough. It has been delayed between London Paddington and Reading and is now 55 minutes late. 11:22 London Paddington to Worcester Foregate Street due 13:44 is being delayed between London Paddington and Slough and is now expected to be 25 minutes late. Well I did raise at the GWR Customer Panel Meeting this evening the issue of the reliability (or lack of it) currently on the Cotswolds in particular the amount of total cancellations and short running arising from staff or train availability. The core reason given is not much more than what has already been discussed here, viz training of staff for IETs particularly at Worcester. As the staff are trained the issue should be progressively reduced and gone within 2 months or so. Etc Etc. I did strongly advise that customers deserved some high level public explanation and reassurance, and just leaving the cancellations to pile up day after day without one builds up severe reputational damage. Whether this advice is taken up remains to be seen. I hesitate to say this, for fear of tempting the fates, but I do think that your raising of this subject has had the desired effect : there have been no significant cancellations on Wednesday and Thursday of this week. OK, on Wednesday the 19:42 Great Malvern - Paddington was cancelled after Reading, but there's alternatives once you've got to Reading. And some late running, as discussed above. 12:22 London Paddington to Moreton-in-Marsh due 14:00 will be reinstated. Will be formed of 3 coaches instead of 8. First class reduced. There are no reservations on this service. 14:50 Moreton-in-Marsh to London Paddington due 16:29 will be reinstated. I was unable to attend this public meeting but would be interested to hear details of what was discussed - assuming it's appropriate for wider circulation. Due to a points failure at Worcester Shrub Hill all lines are blocked. Train services running through this station may be cancelled or delayed. Disruption is expected until 18:00 10/02. 13:22 London Paddington to Great Malvern due 16:04 will be terminated at Worcester Foregate Street. It will no longer call at Malvern Link and Great Malvern. It is being delayed at Evesham and is now expected to be 35 minutes late. 14:22 London Paddington to Great Malvern due 17:00 will be delayed at Moreton-in-Marsh. 14:35 Great Malvern to London Paddington due 17:26 is being delayed between Worcester Shrub Hill and Pershore. The points round here are all very mechanical - and don't usually go wrong. 13:22 Paddington - Great Malvern arrived Shrub Hill 42 late. 14:22 Paddington - Great Malvern arrived Shrub Hill 28 late; cancelled there. 14:35 Great Malvern - Paddington 71 late. 14:50 Great Malvern - Weymouth (OK, not the Cotswold line) cancelled at Shrub Hill. 15:13 Hereford - Paddington 41 late. 16:57 Foregate Street - Paddington started from Shrub Hill and ran to time. 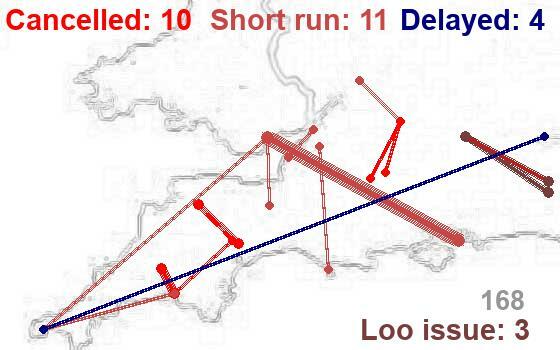 07:59 Paddington - Great Malvern cancelled after Shrub Hill "owing to a problem with the brakes" (RTT). 25 late at Shrub Hill. 08:39 Shrub Hill - Paddington 28 late - delayed at Charlbury by the above. 11:33 Great Malvern - Paddington started from Shrub Hill. Facilities on the 15:42 London Paddington to Worcester Foregate Street due 18:07. Will be formed of 3 coaches instead of 8. 18:26 Worcester Foregate Street to London Paddington due 21:02 will be started from Oxford. 18:30 Hereford to London Paddington due 22:11 will be terminated at Reading. This is due to a shortage of train managers. Will be formed of 3 coaches instead of 5 from Oxford. And that's misleading as it should be an eight coach HST but has been replaced by a Turbo for the last 21 days. as was the outward 05:47 Paddington to Worcester Foregate Street. Curiously, Realtime Trains gave the reason for this cancellation as being "due to the train being swapped (YU)". 09:21 London Paddington to Worcester Foregate Street due 11:31 will be cancelled. 12:00 Worcester Foregate Street to London Paddington due 14:27 will be cancelled. From the time of these posts, a last-minute change. 14:21 London Paddington to Worcester Foregate Street due 16:44 will be cancelled. Edit to add that the following 15:22 Paddington to Great Malvern is running with just three coaches. Going to be a cosy one. Both correct it appears, the stock that came out of the depot intended for the 05:47, was instead used for the 05:19 to Swansea, as the stock for this possibly had no driver.